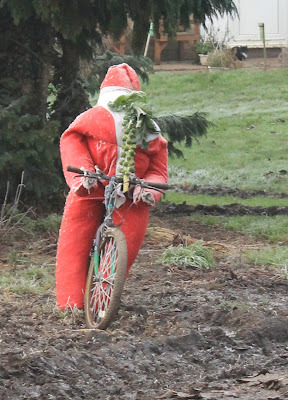 Father Christmas, on a mountain bike, delivering the Brussel Sprouts to go with the Christmas turkey, or SPAM. Strangely the leaves at the top look like a rather splendid handlebar moustache but the Santa suit looks as if it's full of wind. No wonder there's a wind farm nearby because there are fields and fields of sprouts. I wonder how many thermal units there are in one Brussel Sprout. There will be strong winds over the holiday period; lady, kindly put those matches away please, absolutely no naked flames!